The Windian Subscription Series has been one of my favorite things the last few years. 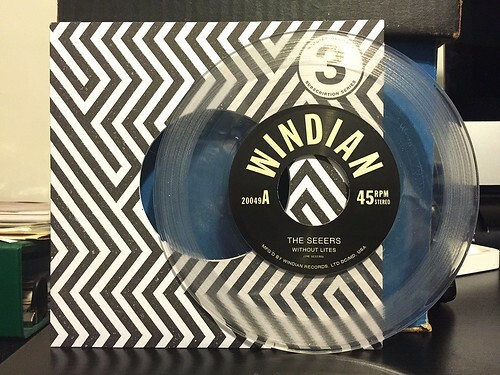 As it is I'm a sucker for a good singles club, but with Windian you get the records all at once and in a fancy little box set as well. I'll take a picture of the box on Friday, but I'm starting off today with the first of the five 7"s in the set. I can't say I had ever heard of The Seeers prior to listening to this record, but that's exactly what I like best about a singles club. Any chance I have to check out some new bands from a label I trust is a chance I'm going to take every time. Kind of like how I used to buy tons of compilation albums back in the 90's. Of course, I just read that this 7" is the band's debut release, so I suppose that could have something to do with me being unfamiliar with them. Anyway, this Seeers 7"s is really great. A-side "Without Lites" is upbeat and poppy with lots of vocal harmonies and shimmering lead guitar in the chorus. On the flip side is "In Jail. On My Mind, In A Prison..." which is slightly more aggressive and a bit faster than the band's other song. The guitar riffs are a bit dirtier, but the softer vocal melody provides a nice contradiction and keeps the song rooted in pop. Both of The Seeers' contributions to this record are real eye openers. I really dig both songs and this is a band I'm going to have to keep an eye out for in the future.